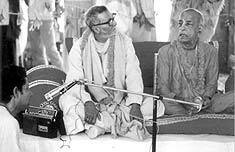 Audio: Historic recording from 1973 of Srila Sridhar Maharaj and Srila Swami Maharaj Prabhupad discussing together in Nabadwip, and Srila A.C. Bhaktivedanta Swami Maharaj Prabhupad describing to the devotees how he came in touch with the Gaudiya Math and Vaishnavas. He describes the background history of his long relationship with Srila Bhakti Raksak Sridhar Dev-Goswami Maharaj and very affectionately glorifies Srila Guru Maharaj: "from the very beginning I knew he was a pure Vaishnava and devotee..."
Audio: Srila Bhaktivedanta Swami Maharaj Prabhupad - grand Guru of Chaitanya Mahaprabhu's sampradaya. Srila Bhakti Sundar Govinda Dev-Goswami Maharaj recalls their intimate relationship and the lecture he gave when suddenly asked to speak at the opening of the Chandradoya Mandir in Mayapur. 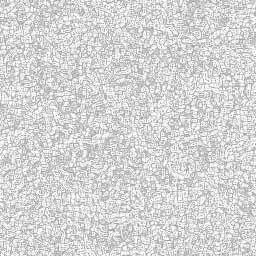 "There were many good and big servitors of Srila Saraswati Thakur present at that time, but Krishna chose Abhay Charan De (Srila Swami Maharaj), who was an unknown person. And now he is famous as a Devotee General of Srila Saraswati Thakur ... Everybody must pay obeisance to him." Audio: Srila A.C. Bhaktivedanta Prabhupad's disappearance day 1998. Informal discourse by Srila Bhakti Sundar Govinda Dev-Goswami Maharaj in our Vrindavan Temple on this day. "What Srila Swami Maharaj has done, Guru Maharaj always told: it is not a man's work. No one human can do this job that Srila Swami Maharaj has done. It is my experience, unbelievably happy experience, I have seen everywhere has spread Krishna Consciousness, everyone knows now the Name of Radha Krishna, the Name of Nitai Chaitanya, Pancha Tattva. Even in front of the Kremlin they are telling Hare Krishna! The whole world now knows Hare Krishna! But it is not a man's job. The embodiment of Nityananda Prabhu can do it. We consider as Srila Guru Maharaj said, that he (Srila Swami Maharaj Prabhupad) is 'shaktyavesa avatar', that is, Nityananda Prabhu only can do this, to distribute Gaura Mahaprabhu, to distribute Radha Krishna devotion; it is not possible by man." Audio: Srila A.C. Bhaktivedanta Prabhupad, always in Vrindavan. Srila Bhakti Sundar Govinda Dev-Goswami Maharaj tells about a letter he received from Srila Swami Maharaj Prabhupad asking instruction from Srila Sridhar Maharaj whether he should stay and continue his preaching in the West or go to Vrindavan to leave his body there. Old pictures of a visit of Srila Bhaktivedanta Swami Maharaj Prabhupad to Srila Bhakti Raksak Sridhar Dev-Goswami Maharaj at Sri Chaitanya Saraswat Math, Nabadwip. Pictures kindly sent by Jagamohini Devi Dasi in remembrance of Srila Swami Maharaj Prabhupad on his Disappearance Day Festival today (17 November 2012). 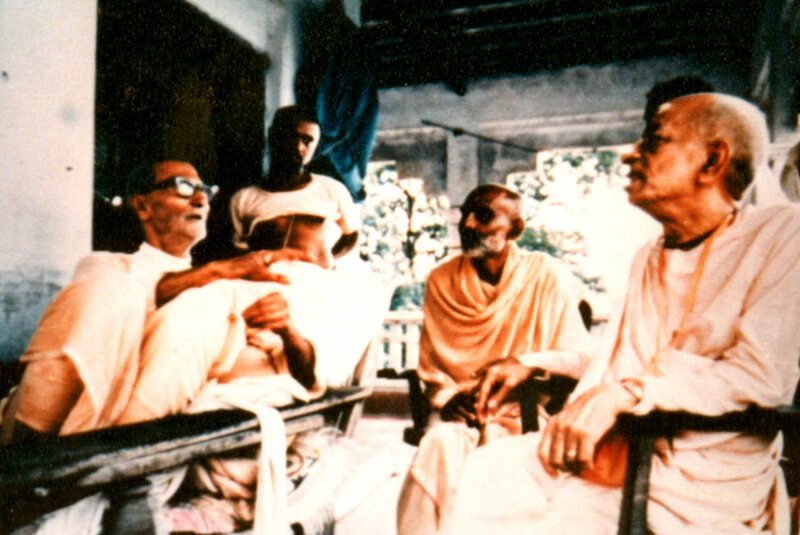 Historic photo of Srila Guru Maharaj with Srila Swami Maharaj Prabhupad on Srila Guru Maharaj Srila Bhakti Raksak Sridhar Maharaj's veranda, Sri Chaitanya Saraswat Math, Nabadwip. This photo was received in response to the recent audio posting recording their informal discussion in Nabadwip. Transcription: Srila Swami Maharaj's Unlimited Glories are being sung from World to World. Lecture by His Divine Grace Srila Bhakti Sundar Govinda Dev-Goswami Maharaj on the Appearance Day of Srila A.C. Bhaktivedanta Swami Prabhupad, 21 August 2003, in St. Petersburg, Russia. Download here. Srila Swami Maharaj Prabhupad and Srila Sridhar Maharaj's relationship and an excerpt from the Guardian of Devotion magazine of San Jose, USA. Srila A.C. Bhaktivedanta Swami Prabhupad inundated the world with Krishna consciousness. In the excerpt The Universal Conception of Guru from one of his essays, he smashes the sectarian misconception that the Spiritual Master is limited to a particular person, form, or institution, and establishes the universal conception of Guru. This lecture was originally published in The Harmonist in 1936, on the Advent Day of His Divine Grace Om Vishnupad Srila Bhakti Siddhanta Saraswati Thakur. It was reprinted as the Preface to Srila Sridhar Maharaj's Sri Guru and His Grace in 1983.